As Valentine’s Day approaches, Southern Sun Ikoyi Hotel, Lagos, has announced special offerings to ensure that guests and visitors have a splendid experience on the day. According to the hotel’s management, from Thursday, February 14 to Sunday, February 17, Southern Sun is offering guests the opportunity to enjoy discounted rates on its rooms, inclusive of a refreshing breakfast for two adults. Renowned for its culinary expertise and complete after meal experience, Southern Sun Ikoyi’s Head Chef and his team aim to further raise the bar, as plans are in place to titillate the taste buds of guests and satisfy their cravings with exotic Valentine’s seafood buffet dinner and an a la carte menu on request, accompanied by the finest of wines for lovers and couples to relish such magical moment while it lasts. 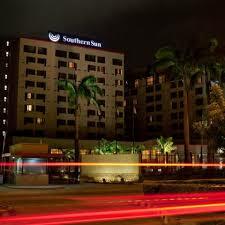 This year’s celebration at the Southern Sun Ikoyi presents a unique getaway experience for couples and lovers to enjoy a serene environment away from the bustling Lagos traffic whilst witnessing the synergy of top quality offerings the hotel is renowned for, ranging from its artistic designs, quality service, finest lodging and dining experience in the heart of Ikoyi.